Solar Voyager: realmoh - "Evolved Red Dwarf"
We have 0 member(s), 0 spiders, 18 guest(s), and 0 anonymous users online. realmoh - "Evolved Red Dwarf"
2.5 trillion years in the future: This previously Red Dwarf with 16% of the solar mass has evolved in a so called Blue Dwarf. Most of the hydrogen in the entire star is consumed. By increasing the surface temperature and luminosity (to about a third of the solar luminosity) it reaches a new equilibrium that lasts another 5 billion years. In this far future of the universe most of the more massive stars are „dead”, changed into White or Black Dwarfs, Neutron Stars or Black holes. The luminous part of the still existing galaxies now are made of evolved Red Dwarfs. Very slowly the era of the luminous stars is going to an end… in about 100 trillion years the universe will go dark and black for human eyes (if the theories of the expanding universe are „true”). 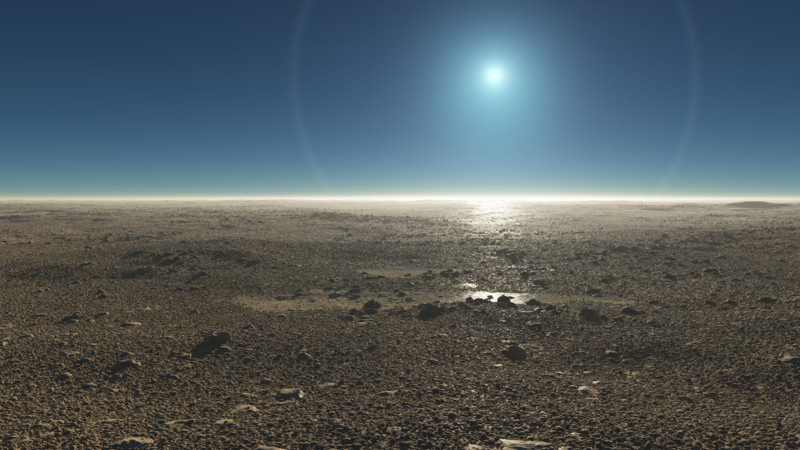 The render: An evolved Red Dwarf in the sky of a previously cold planet outside the habitable zone. Because the increased luminosity the planet is now in the middle of the new habitable zone, and ice of different origin aged billions of years begins to melt and forms a new atmosphere and shallow ponds, birthplaces for a second evolution. There is no more geological activity and the entire planet is a vast plain, mountains and valleys eroded to boulders, stones, pebbles and dust in the last 2.5 trillion years. Nevertheless life will find a way. Please try make some simple animation. Why should I? I'm not at all skilled for creating animations. I prefer stills. This page was generated in 0.4385 seconds.